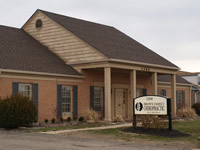 We are located on the west side of Hamilton on NW Washington Blvd. right off of Eaton Avenue near Hamilton High School. You can't miss our big white and black sign! Office is on the right side of the road.